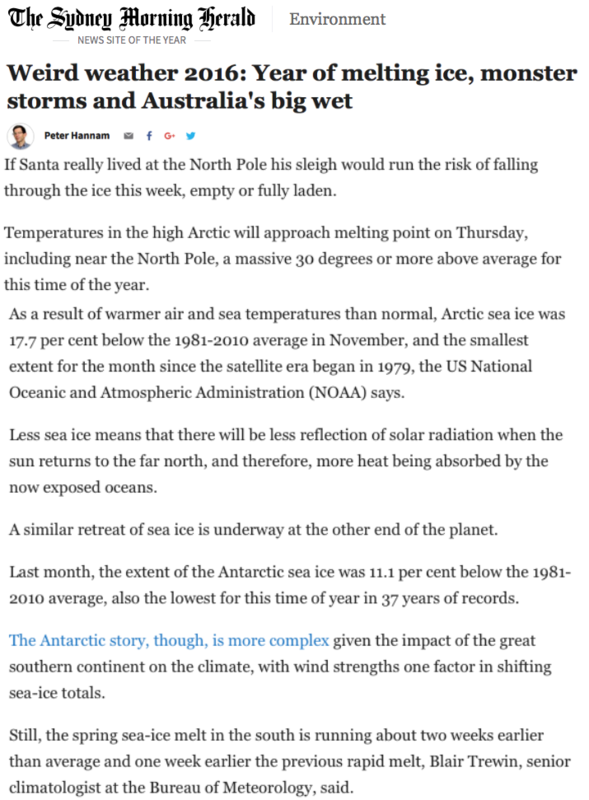 On December 21, Peter Hannam and the Sydney Morning Herald printed some spectacular misinformation about the climate. Since he wrote that article one week ago, Arctic sea ice has grown 500,000 km² and is very close to where it has been in all recent years. 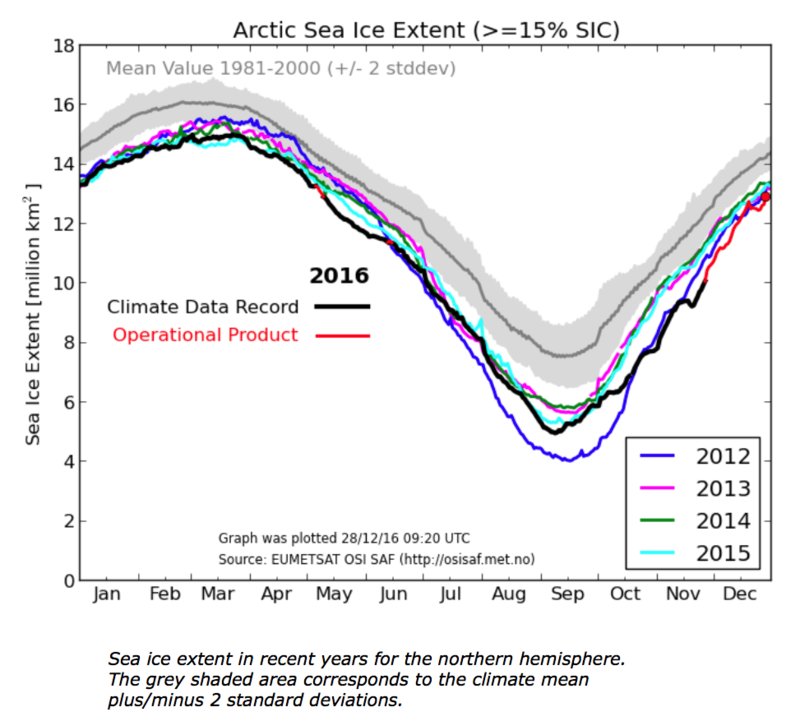 Arctic sea ice has grown rapidly and is 250% of what it was three months ago. There is no absolutely way of knowing what extent will be at its peak in three months, and anyone who claims they know is a fraud. 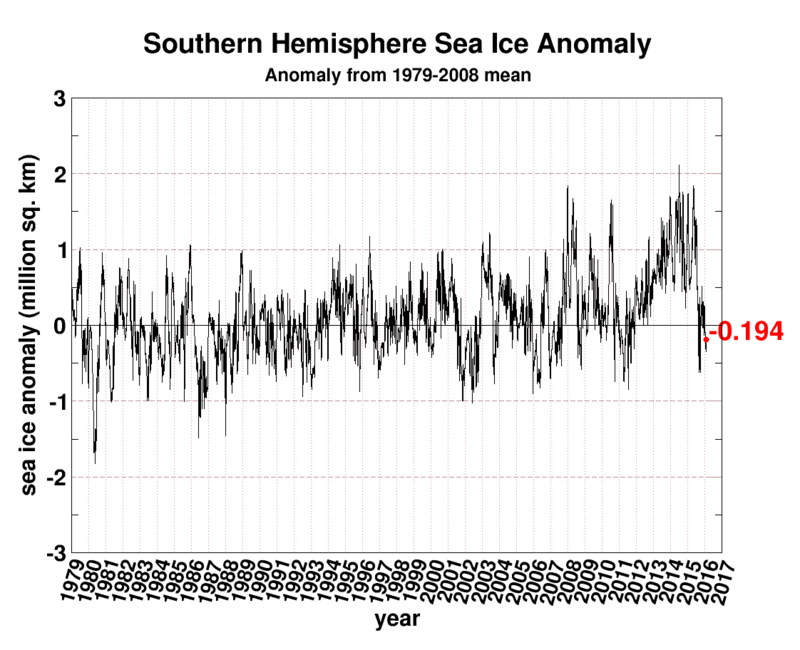 NOAA sea ice satellite records go back to 1973, not 1979. This is important because 1979 was right at the peak, and sea ice extent was nearly two million km² lower in 1974. Ignoring the years before 1979 is extremely dishonest. 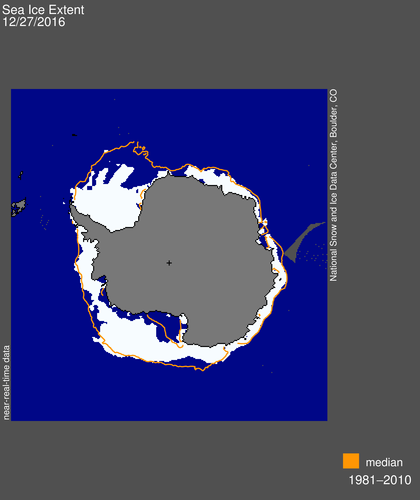 Around most of Antarctica, sea ice extent is normal or above normal. 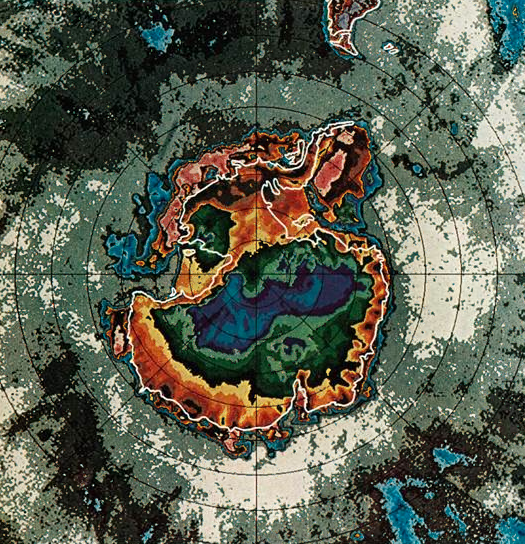 The only deficiency is in the Weddell Sea. 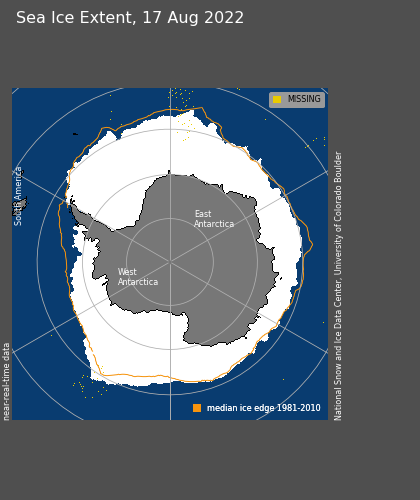 Antarctic sea ice has been growing for decades, and was recently at a record high. This year is an outlier, not a trend. As far as the wet weather in southeast Australia goes, nine years ago The Sydney Morning herald said southeast Australia was in a permanent drought. They have no clue what they are talking about. Australia has always had alternating droughts and floods. Journalists have been blaming white men for climate change in Australia for 170 years. 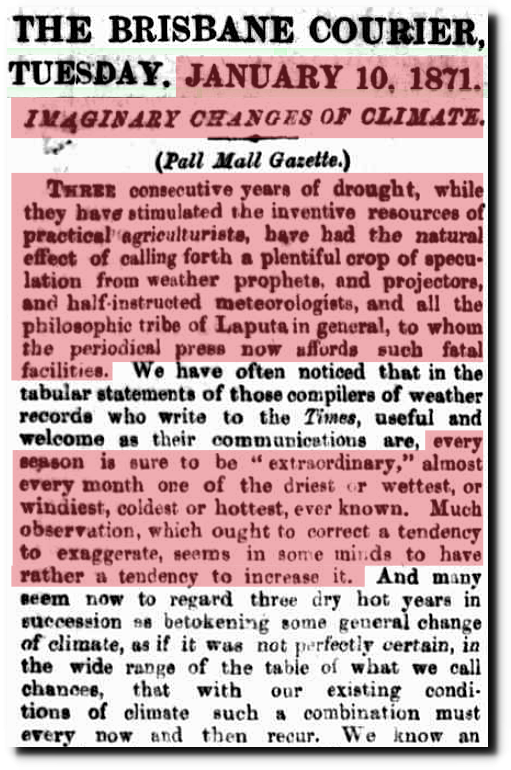 Australian journalists have been imagining climate change for hundreds of years, and using incorrect statistics for at least 145 years to justify their claims. THREE consecutive years of drought, while they have stimulated the inventive resources of practical agriculturists, have had the natural effect of calling forth a plentiful crop of speculation from weather prophets and projectors, and half-instructed meteorologists, and all the philosophic tribe of Laputa in general, to whom the periodical press now affords such fatal facilities. We have often noticed that in the tabular statements of those compilers of weather records who write to the Times, useful and welcome as their communications are, every season is sure to be “extraordinary,” almost every month one of the driest or wettest, or windiest, coldest or hottest, ever known. Much observation, which ought to correct a tendency to exaggerate, seems in some minds to have rather a tendency to increase it. 10 Jan 1871 – IMAGINARY CHANGES OF CLIMATE. I have examined several Peter Hannam articles about climate, and they are pretty close to 100% incorrect. Peter can kiss the climate scam goodbye on January 20, 2017. All liberals should be made to sour down and watch Regan’s “A Time For Choosing” speech from the 60s. It’s all still true today. They haven’t changed. Once again, you’ve delivered a teaching moment. 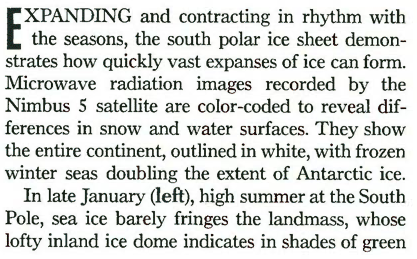 Silly me, I assumed the satellite records on ice started in 1979! Thank you. Again. Happy New Year! Just allowing skeptics a voice will help a lot. Then cut off ALL Federal funding to the Marxist universities. The National Academy of Sciences was chartered by Congress in 1863 as a private, nonprofit, non-governmental organization set up to advise the government and the nation on scientific and technological matters. The federal government funds about 85 percent of our work. The National Academies of Sciences, Engineering, and Medicine are trusted and valuable resources for independent, expert advice — not only for Congress and the federal government, but also for state and local government agencies, nonprofit institutions and foundations, and others. Those who request a study depend upon our reputation for independence and unique ability to bring together leading experts, weigh the evidence, and produce reports that inform sound policies and educate the public. With an annual budget of $7.5 billion (FY 2016), we are the funding source for approximately 24 percent of all federally supported basic research conducted by America’s colleges and universities. In many fields such as mathematics, computer science and the social sciences, NSF is the major source of federal backing…. NSF leadership has two major components: a director who oversees NSF staff and management responsible for program creation and administration, merit review, planning, budget and day-to-day operations; and a 24-member National Science Board (NSB) of eminent individuals that meets six times a year to establish the overall policies of the foundation. The director and all Board members serve six year terms. Each of them, as well as the NSF deputy director, is appointed by the President of the United States and confirmed by the U.S. Senate. At present, NSF has a total workforce of about 2,100 at its Arlington, VA, headquarters, including approximately 1,400 career employees, 200 scientists from research institutions on temporary duty, 450 contract workers and the staff of the NSB office and the Office of the Inspector General. The Current Director is Dr. France A. Córdova an astrophysicist and the 14th director. France A. Córdova, was nominated by President Barack Obama and sworn in as director of the National Science Foundation (NSF) on March 31, 2014. Córdova was the vice chancellor for research and professor of physics at the University of California, Santa Barbara. Previously, Córdova served as NASA’s chief scientist. Prior to joining NASA, she was on the faculty of the Pennsylvania State University where she headed the department of astronomy and astrophysics. She received a Bachelor of Arts degree from Stanford University and PhD from Cal Tech. It looks like who ever is next president gets to replace her in 2020. That leaves cutting funding to the bone which I am ALL FOR! I love that Brisbane Courier, 1871, article. It could be written today and would still be applicable. NSIDC today gives the Arctic sea ice area as only -0.018 Wadhams below previous low in 2010.. I suspect that this is well within any margin of error. He’s also trying to claim the hurricanes this year were terrible, though the global ACE is coming in at a whopping 103% of normal. yeah based on an average since 1981. I’d like to see what the year 1979 looked like (that included Camille). Yes, Melbourne had a goodly dose of permanent drought yesterday.